Today we added a feature to the Google 3D Warehouse that allows you to track search results and collection contents using a feed reader, like Google Reader. How is this useful? Well, suppose you wanted to keep an eye on which buildings in your town were being accepted into Google Earth. Go to the Google 3D Warehouse and type in your search; in our example "near:[city] is:best-of-geo". Click the "Sort by date" link under the top blue bar. Click the "Subscribe to this search" link in top right corner. 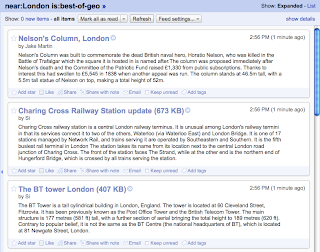 This allows you to subscribe to the search results using a feed reader. Choose your favorite feed reader to subscribe to the feed. If you're starting in SketchUp you'll need to right click on the link, select "Copy shortcut" (PC) or "Copy Link" (Mac), and past the results into your reader. Browsers may use different terminology in the right-click menu; Chrome uses "Copy link address" and Firefox uses "Copy Link Location". For now, we support subscribing to searches and collection contents, but we'll add more options over time. I like the idea of RSS feeds of the 3D Warehouse! I had an idea about feeds, could you guys make a comment feed? I mean an RSS feed of all the latest comments on your models. I remember when I used to have an account on the warehouse with 300+ models on it, and I was trying to check each and every one of them for new comments. To a lot of folks on the 3D Warehouse, like me, comments are important, so people would request ratings, models, make reviews, suggest things, and just use the commenting feature on models to interact with others, instead of email. Using Google Groups is okay for this "community of comments", but people use the 3d Warehouse instead. So we modellers feel compelled to check our model's latest ratings daily, so we could hold conversations, swap ratings, and other things. When that button will appear in hl=ru ? Any way to form a valid RSS address from this, so as to use it in a gadget on a web page, rather than with feedreader?